Hanoi (VNA) – Prime Minister Nguyen Xuan Phuc welcomed the new Ambassadors of Malaysia and Thailand to Vietnam during his separate receptions in Hanoi on June 14. 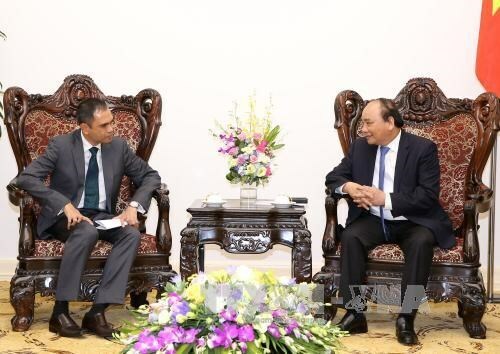 Meeting Malaysian Ambassador M. Zamruni Khalid, the Government leader asserted Vietnam always treasures its strategic partnership with Malaysia and wants to make it stronger. The Vietnam-Malaysia action plan for 2016-2018 should soon be put in place and agreements on the transfer and extradition of the convicted, aviation service, education and legal support should be sealed to serve cooperative activities, he suggested. He stressed the need to establish a deputy ministerial defence dialogue mechanism, a joint patrol method, and a hotline to step up fishery affiliation, search and rescue operations and the combat against pirates. The fifth meeting of the Joint Committee on economic, scientific and technological cooperation should be convened in this third quarter, he noted, expressing his hope that the Malaysian Government will support Vietnamese businesses’ investments in its country. On the issue of Vietnamese workers in Malaysia, he told the diplomat about the need to cooperate in handling emerging issues to ensure the workers’ rights and interests and encourage their contributions to the host country’s socio-economic development. He hoped the two countries’ close collaboration and mutual support at multilateral forums in the region and the world will continue. Ambassador M. Zamruni Khalid said his country is working hard to complete the two countries’ 2016-2018 action plan. He expected the Vietnamese Government will help Malaysian enterprises coming to seek to invest and do business in Vietnam. Receiving Thai Ambassador Manopchai Vongphakdi, PM Phuc showed his delight at the two countries’ growing two-way trade, which hit 11 billion USD and is set to reach 20 billion USD before 2020. Among the world’s three biggest rice exporters, both countries should work together to bring about benefits for their people, he said, suggesting increased connectivity in other realms also, especially employment. Ambassador Manopchai Vongphakdi conveyed the greetings from the King and Prime Minister Prayut Chan-ocha’s invitation to visit Thailand to Prime Minister Nguyen Xuan Phuc.